"Qué rápido y fácil ha sido tener en casa mi compra online! Encantadísima de haberos conocido, reperiré seguro! :-)"
- Technical cookies: Technical cookies are those essential and strictly necessary for the proper functioning of a web portal and the use of the different options and services offered. For example, those that serve for the maintenance of the session, the management of response time, performance or validation of options, use security elements, share content with social networks, etc. - Personalization cookies: These cookies allow the user to specify or customize some characteristics of the general options of the website. For example, define the language, regional configuration or browser type. - Facebook, Pinterest and Zopim cookies (chat). It's very easy! 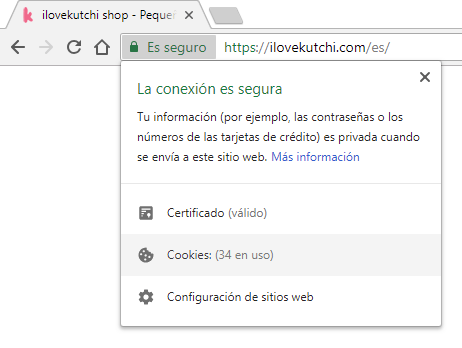 You only have to go to the navigation bar where our web address ilovekutchi.com comes out, click on SECURE and you will get a drop down with several options. One of them is COOKIES. Click and select which ones you want to delete. We leave you a printscreen to illustrate what we have just explained.